Hello everyone! I have a yummy and healthy smoothie recipe for you today! I’ve been having fun experimenting with the Vitamix we received for Christmas. I’m not gonna lie, some things taste a little “too natural” for me, like…um…eating grass. But this one seems to work well for my taste buds and is fairly healthy so I thought I would share it! Yeah, so just dump it all into your Vitamix and turn it up to high! 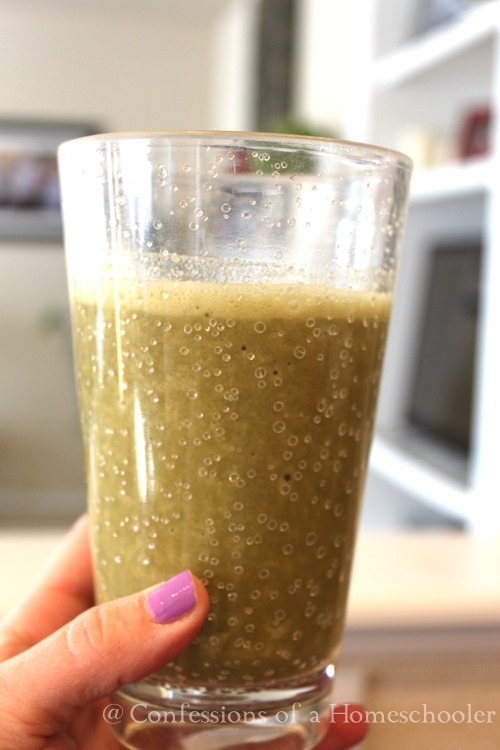 I’m not sure a regular blender would mix the spinach enough, but if you have a good one it’s worth a try! And you’ll end up with something like this, don’t be afraid of the light green color. It’s just the spinach, but the taste is still nice and fruity from the oranges. 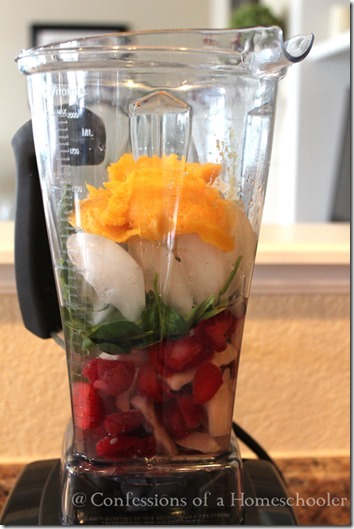 And you know you’re getting some good vitamins in this smoothie too! Let me know what you think if you try this recipe! It does have a little spinach flavor in it, but the orange cuts it down enough in my opinion to make it easy to drink. I’ll share some more as we get better at this thing. Jason (my husband for newer readers) is obsessed with making all vegetable smoothies. But to me they taste too much like grass/dirt, so I haven’t been willing to share them yet! But I’m working on getting one that tastes good and is worth it’s weight in veggies. Have a good recipe to share? Make sure to leave a comment below! 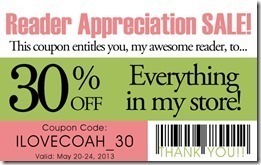 Just a reminder, today is the LAST day of my storewide 30% off sale! Trust me you will acquire a taste for these. I love apples, pineapple, or grapes in mine. They are natural sweeteners. I , also enjoy Kale or collards in mine in addition to the spinach. Healthy and delicious way to start your day. Almond milk, banana, PB2 (powdered peanut butter), a squirt of chocolate (or chocolate protein powder) and about 1/4 c crushed ice. I also do frozen berries (the Costco mix), vanilla protein powder, and almond milk. Almond milk is great in smoothies – I usually use in place of water. I throw spinach into the berry smoothie when I have it. We also make a lot of soup in our vitamix. A fav is asparagus (steamed OR the frozen grilled asparagus from Trader Joe’s), hot water, and a heaping spoon of creme fraiche. Yummy. Hi Amy what other soups do you make in your vitamix? I have done some of the recipes above and they are great. One easy and good recipe that we use here that is a hit is: 1 banana broken into pieces, 4 or 5 frozen strawberries, small handful of blueberries, you can add flaxseed meal if you want to and then I cover it with coconut milk and then blend. Sometimes we leave the blueberries out. Yum! We make similar smoothies, adding plain yogurt and a little bit of coconut oil. The little bit of healthy fat and protein help ease the sugar-shock from the fruit! So delicious, and a great way to get kids used to the taste of greens! My current favorite is from the book, The Homeschool Experiment. 1 c. Kefir, 1/2 c milk, 3/4 c blueberries, 1/2 frozen banana, handful of spinach, 2 tsp. stevia (I sometimes uses honey). Blend it together and enjoy. I keep everything but the liquid stocked in the fridge. When bananas are a good price, I buy 2 or 3 extra bunches, slice them at home and freeze them on a waxed paper covered cookie sheet. When they are frozen, I place them in a ziploc bag. I buy a big bag of spinach and divide into ziploc bags and freeze those. LOVE IT! !